After you’ve rolled your ankle, your number one concern (after the pain, of course), is usually going to be when will you be able to get back on your feet and return to normal life. While we an generally say that all sprains will heal somewhere 3 days to 12 weeks, we really need to take into account the damage done by the sprain in order to properly predict how long it will take to heal. 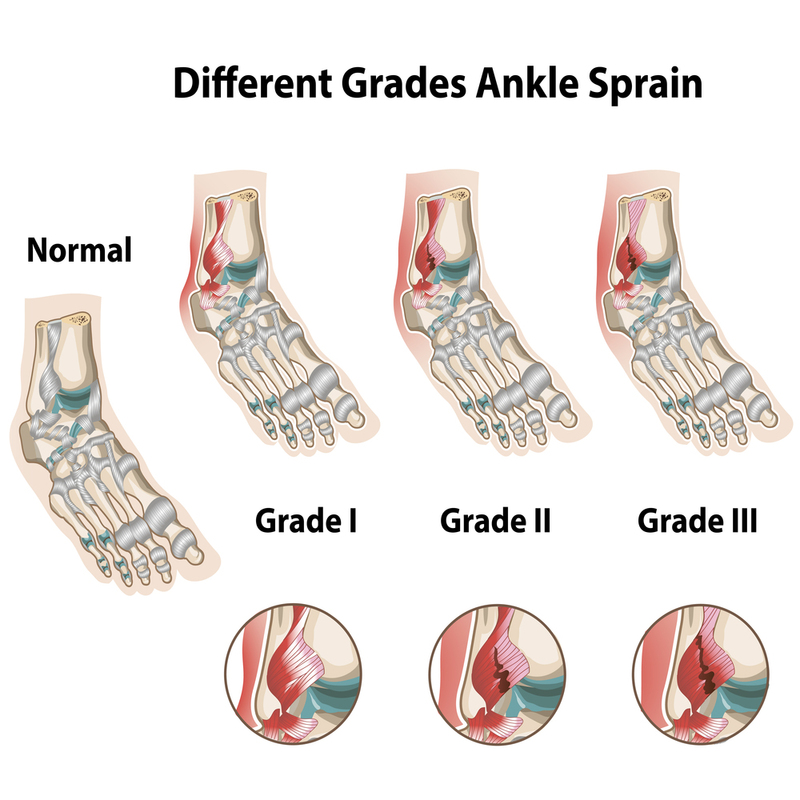 Doctors will usually categorize sprains into three different grades depending on their severity. These grades can give you a good indication of how long it will take for you to recover. For a grade 1 sprain, there is only minimal damage and stretching to the ligaments in the ankle, so they will usually heal quite quickly. Depending on the age and general health of the patient, most doctors would expect a grade 1 sprain to heal fully over one or two weeks. Usually, they don’t require any physio therapy or anything like that, but some strengthening exercises would be good. For a grade 2 sprain, the ligaments on the ankle have actual had a partial tear, so recover time will be much longer. It might be somewhere between 4 and 6 weeks before the patient is fully healed, and they should definitely talk to their doctor about how to aid their recovery and what steps they will need to take in order to get their ankles back to full strength. For a grade 3 sprain, the ligaments in the ankle will have been completely torn, and as such, there is a long and painful road to recovery. It may be as long as 12 weeks or more before the patient is back to normal, and they may even require surgery. Physio therapy will almost definitely be needed as well. Unless you are certain that your strain is very mild, we fully recommend that you always consult with your doctor and work out a recovery plan for you. Your physician will also be able to give you a personalized estimate of when you can expect to recover. more importantly, your doctor will be able to advise you if an Xray or MRI scan is needed; sometimes, sprains can be a lot more serious than they appear. Before you run out to the local Vietnamese restaurant or run down the grocery store for a bag of Basmati, we’re not talking about the rice that you eat, but rather following the 4 steps of Rest, Ice, Compression and Elevation. Ever good doctor or physio therapist knows that most grade 1 and 2 sprains can simply be treated at home by applying this time tested mothod. Even your grandma knows it. , So, for minor injuries or light aches and pains, give them a bit of RICE and see if that helps. If it does, you might be able to save yourself a trip to the hospital. However, if you are in severe pain or can’t put any weight on the ankle, its time to go see the doc as an X-ray or MRI might be needed. Rest – Obviously, you really need to rest a sprained ankle. Avoid all unnecessarily movement and definitely but all your exercise activities on hold. don’t put any weight on the injury, and if you really need to walk, try using crutches but only if it doesn’t hurt to use them. Ice – For the first 48 to 72 hours, your sprain will be swollen and very tender. Try using an ice pack or a bag of frozen vegetables on it for around 20 minutes every 2 hours or so. This will help keep the swelling under control and relieve some pain. Make sure you wrap the ice or vegetables on a cloth or tea towel so as to avoid getting an ice burn. Compression – For the first 24 to 32 hours, the ankle should be wrapped. This will help keep everything in the proper place to allow the healing to begin, give your ankle some support and also help with swelling. A good ankle brace will be a great help here.